LACONIA — Les Cartier and Phil Spagnuolo Jr., the two candidates in today's special election for state representative, favor some gun control measures that have been receiving support nationally following the Florida school shooting. The Belknap County District 3 election will determine who succeeds the late Rep. Don Flanders, R-Laconia. Gun regulations pushed following the Feb. 14 shooting in Parkland, Florida, which killed 17 students, include raising the age for buying rifles from 18 to 21, banning “bump stocks,” which allow semi-automatic rifles to operate like an automatic, prohibiting sales of AR-15 assault-style rifles, and the arming of certain school employees. Cartier, a Republican, said he would support the age increase. “You can't get a pistol until you're age 21, and that's a weapon, same as a rifle,” he said. It would be helpful if some school teachers were armed, said Cartier, a retired hazardous materials expert who worked for the state Fire Marshal's office. Many school teachers want no part of such a proposal and the NEA-New Hampshire, the state's largest teachers' union, called arming educators “an abominable idea.” Opponents of the idea say even trained law enforcement officers have difficulty quickly engaging and eliminating active shooters in crowded areas. Cartier said he has “no problem” with eliminating bump stocks, but is “neutral” on the question on whether AR-15 rifles, which have been used in many school shootings, should no longer be sold. State Rep. David Huot, D-Laconia, a former judge, has said that, if re-elected, he would introduce a bill that would ban the sale or transfer of AR-15s. Spagnuolo, a founding member of Navigating Recovery in Laconia, favors such a prohibition and also supports a ban on bump stocks. He questions the idea of arming teachers. Cartier and Spagnuolo agree on a couple of legislative issues that have been in the news. On Feb. 8, the House failed to support an effort to reconsider a bill calling for the state to pick up 15 percent of local government costs for employee retirement. The effort failed on a 170-171 vote, which was largely on party lines, with Republicans opposing reconsideration, and Democrats favoring it. These retirement costs have been growing rapidly and the state's contribution to covering these expenses has declined from 35 percent to zero. City Manager Scott Myers sent a letter to the four Laconia representatives, asking them to support the bill, but when it came time to vote, Democratic Rep. Charlie St. Clair was out of town on previously scheduled business, Republican Rep. Peter Spanos did not vote, Republican Rep. Frank Tilton voted against and Democratic Rep. David Huot voted in favor. Both Cartier and Spagnuolo said they would have voted to reconsider the bill. Cartier draws benefits as a retired government worker. Another issue that has rankled some municipal officials is the state's failure to live up to a statute calling for the hotel and restaurant tax to be divided with state getting 60 percent and localities receiving 40 percent. In recent years, lawmakers have given municipalities about 25 percent. Both men said the state should live up to the original formula. The two men differed in approach to the Northern Pass, the $1.6 billion project that would bring Canadian hydropower through New Hampshire to Massachusetts. Many communities that would be bisected by the power lines objected, saying it would be disruptive, damage views, hurt tourism and harm the environment. Proponents said it was important to the state's economy, would bring jobs and had the potential for lowering energy costs. Some localities, such as Franklin, where a power converter station was to be built, were major supporters. Republican Gov. Chris Sununu has been a big supporter of the project and objected to that decision, saying the committee did not give it proper consideration and short-circuited the process. Cartier supports the committee's decision against the project, which featured large transmission towers in some areas where the line would not be buried. “I would rather bury most of it, instead of having the high lines,” Cartier said. “This keeps the views and that's what most people come to New Hampshire for. “It's a pass-through for Massachusetts, Connecticut and New York. We’re not getting the benefit of the electricity that will be passing through our yard. 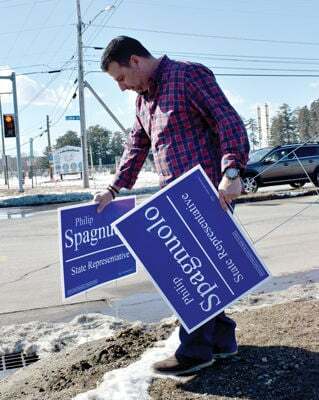 Spagnuolo seems to concur with the governor. “There is a process to be followed, and I agree it wasn't followed,” he said. After the school shooting in Florida, suggestions have been made to raise to 21 the minimum age for purchasing rifles, banning sales of AR-15 rifles, prohibiting “bump stocks” that allow semi-automatic rifles to simulate an automatic weapon and the arming of certain school employees. What are your opinions of these proposals? Supports increasing the age for rifle purchase to 21. “Neutral” on whether or not to ban sales of the AR-15. Supports banning bump stocks. Supports the idea of certain school employees being armed. 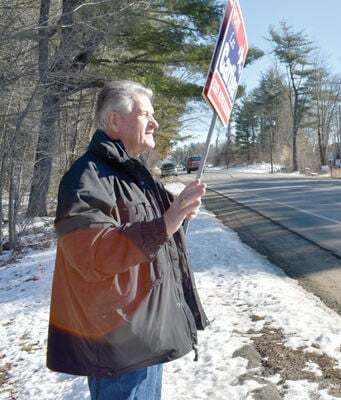 In the New Hampshire House of Representatives, a measure to have the state pick up 15 percent of local government costs for public employee retirement narrowly failed a reconsideration vote. The state once picked up 35 percent of these costs, but has reduced that commitment to zero. How would you have voted on that bill? The formula for sharing restaurant and hotel taxes calls for a 60-40 split, with the state getting 60 percent, and municipalities getting 40 percent, but in recent years the state has provided about 25 percent to municipalities. Would you support efforts to have the state live up to the original formula? Do you agree with the Site Evaluation Committee's denial of the application for the Northern Pass project? Ward 2, St. Andre Bessette Parish Hall, 30 Gilford Ave.
Ward 3, Laconia Middle School – Multipurpose Room 150 McGrath St.